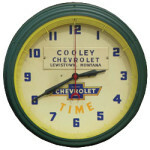 This antique lighted clock features “The General Tire” brand. The dome-shaped clock also has the words “Use our easy pay plan” printed in red and black against the white surface. 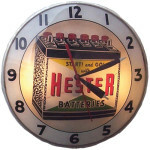 The clock is equipped with hour, minute, and second hand, along with 12 arabic numerals.